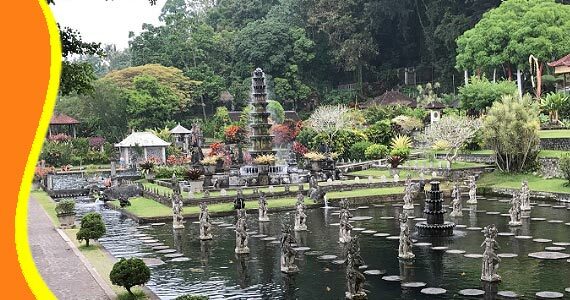 A historical water park in Karangasem, Bali. Cool and Natural. Tirtagangga Bali was built in 1948 by King Anak Agung Anglurah Ketut Karangasem. The palace has been established with a beautiful water park located near natural springs. The natural springs are under a large banyan tree at the foot of the hill. At the top of the hill, there is a village temple. The scenery of Tirtagangga was fantastic with natural and relatively cool atmosphere. Inspire the King to build a palace for his resting place and in the middle with a beautiful recreation park. He called it Tirtagangga - derived from the word Tirta (blessed water) and Gangga (the Ganges, the sacred river in India). Tirta Gangga Karangasem Bali is a unique Water Park blend of Balinese architecture and China. Consists of three separate complexes, each with a pool and sculptures. Complex at the lowest level has two large pools and a water tower. In the second complex (middle level) is a swimming pool. The third level is the main resort complex for the King. Nowadays we can find restaurants and four units of bungalows (leased) in the former palace of King AA Anglurah Ketut Karangasem. You can walk through the Koi ponds. Tirtagangga is located near the village of Ababi, Karangasem, located about 6 kilometers north of the city Amlapura, at a distance of 83 km from Denpasar. Bring your own swimsuit if you want to take a bath here. Also buy some fish food to give to all koi that available in the fishponds. 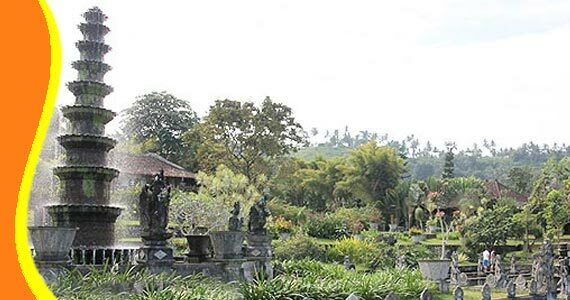 As a historical tourist attraction, Tirtagangga is one of the main tourist destination in the east part of Bali, especially Karangasem Regency. 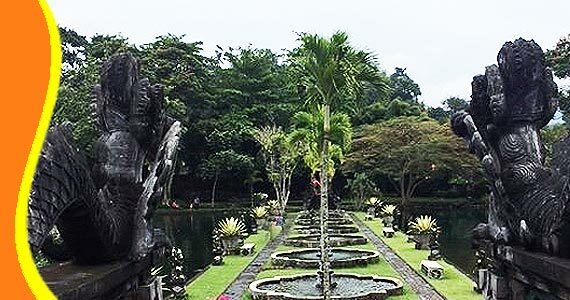 The natural garden around the park, the rice fields surrounded of Tirta Gangga water palace, the beautiful fountain in the middle of pool, the maze on Koi's ponds, will amaze and make you want to stay longer in Tirta Gangga Water palace. 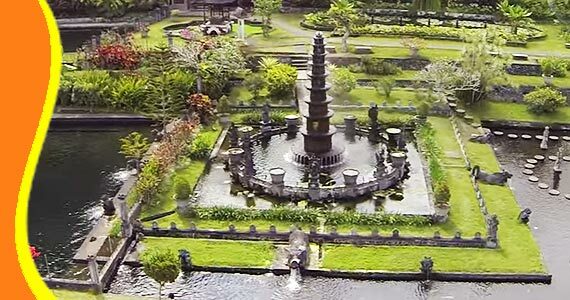 - Admission Fee to visit Tirtagangga Water Garden 2017 is IDR 30,000 for adults, and IDR 15,000 for children. For using the public swimming pool is free. But the above pool that more private and comfortable is with an additional cost. 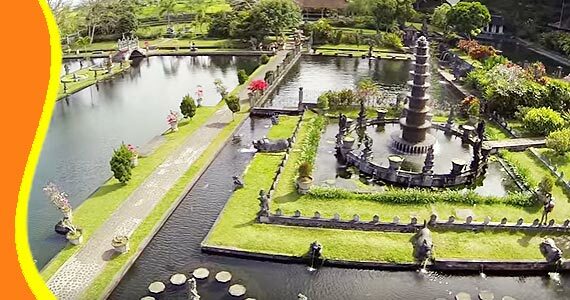 For further explanation and the information about Tirtagangga Waterpark Bali, Tirtaganga Karangasem Royal Palace, Tirta Ganga Transport Bali, Visit to Tirtagangga East Bali. Call & Text Messaging (Chat, Google+, Line, Whatsapp or SMS) our customer services team on the above number, who will help you with all of your holiday needs. Get a Bali Transport from your stay (Bali Resort or Bali Hotel). You can contact us if you need transport to go to Bali Tirta Gangga and other related Bali tourist destination. The Water Fountain at Tirta Gangga Water Palace, look so pretty in the middle of the pool. Tour to Tirtagangga Bali can be combined and implemented in conjunction with other activities Trip or Tour in the same direction. 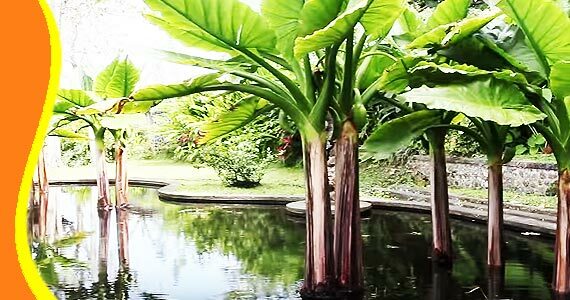 You can Watch here on Youtube Video Player, the situation in Tirta Gangga Water Palace Karangasem. 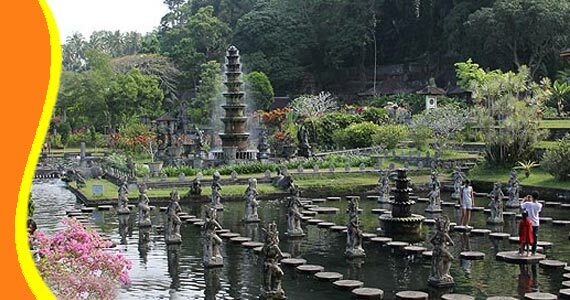 "Tirta Gangga is one of the tourist site, that you have to visit when you exploring eastern Bali. (Markus - Germany)"